Mechanical engineering junior Jonathan Bopp is the epitome of a team player. 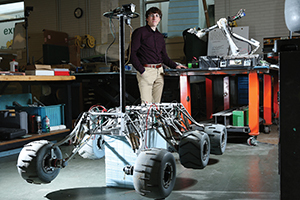 As a second-year member of the Mars Rover Design Team, Bopp spent nearly every spare hour last spring in the Kummer Student Design Center working to perfect the 2014 Mars rover. But that isn’t unusual for a student design team member at Missouri S&T. What sets Bopp apart is his single-mindedness in designing a robotic arm that can perform all the functions a Mars Rover might need, including the ability to retrieve tools, collect soil samples and maintain equipment in the field. Bopp saved the money he earned during a 2013 summer internship to buy a 3-D printer to prototype his rover designs. He used the printer to build plastic models of the gears and drills that were used on the 2014 rover, then tested them for durability. He says he and the other team members were a little concerned about the plastic’s ability to withstand wear and tear, but they liked the cost and weight efficiency of 3-D-printed parts. His work — and that of his teammates — paid off. In May, the team placed second in the University Rover Challenge, an international competition that challenges college students to design and build the next generation of Mars rovers. Missouri S&T was the top team in the United States. This is the second year Missouri S&T’s Mars Rover Design Team competed in the University Rover Challenge. In 2013, the team placed last.